The Pontiac G5 is a new front-wheel-drive coupe that comes in a standard version and a sportier GT. The GT has a firmer suspension, 17-inch tires, and a 173-horsepower, 2.4 liter four-cylinder engine. The standard version comes with a 148-hp, 2.2 liter four-cylinder. A five-speed manual transmission is standard, a four-speed automatic is optional. We drove a Pontiac G5 GT with an automatic and found the four-speed and 173-hp engine provided good acceleration and a pleasing lack of noise or vibration for a four-cylinder even when pushed hard. The ride is a bit firm but not uncomfortable. However, we found the handling of the GT mediocre. Pontiac describes the G5 as a five-passenger coupe, but limited rear legroom make carrying five passengers a serious challenge. Like most coupes, the back of the cabin is best used for parcels. Air curtains are optional and we recommend them. They provide life-saving head protection in a side-impact crash and federal crash tests show they are needed on the G5. Underneath the new Pontiac body are the mechanical underpinnings used on the Chevrolet Cobalt coupe introduced in 2005. Essentially, the G5 is simply Pontiac's version of the Cobalt. 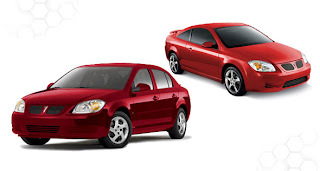 The 2007 Pontiac G5 is available only as a coupe, which means two doors and a smallish back seat. It comes in two versions. The G5 ($14,725) comes with air conditioning, power windows and door locks, AM/FM/CD, fold-down back seat, height-adjustable driver's seat and remote/keyless entry. It comes with a 148-hp, 2.2 liter four-cylinder. The standard transmission is a five-speed manual. The standard model features the FE1 or Smooth-Riding suspension. The G5 GT ($18,375) adds anti-lock brakes, upgraded audio, XM satellite radio, cruise control, and fog lamps. Performance upgrades include a 173-hp, 2.4 liter four-cylinder and the FE3 or Sport suspension with 17-inch wheels and summer performance tires. The standard transmission is a five-speed manual. Options include automatic transmission ($850); air curtain side airbags ($395); remote-vehicle start ($190); sunroof ($750); anti-lock brakes ($400); and OnStar ($695 on the GT and part of $1,090 Security Package on the base model). Safety features include frontal air bags; front seat belts with pretensioners (in a crash these remove the slack). Anti-lock brakes are optional; ABS can help drivers avoid accidents by allowing them to maintain control of the steering at maximum braking effort. We recommend getting it. Always wear those seat belts because they are your most important line of defense in a crash.